But over the past few years, you’ve become more conscious of the way your chin affects your appearance. From looking in the mirror when you brush your teeth to when you see your profile in photos on Facebook or Instagram. So what can you do if you feel like your chin shape is too small and needs to be stronger to balance out your facial features? Chin implant surgery changes the size and shape of the chin, resulting in an enhanced appearance of the chin and jawline. The insertion of a chin implant can take from 30 minutes to 1 hour. It is important to note that while a chin implant can’t reduce your vertical chin height, it can increase your chin height (the distance from the lower lip border to the bottom of your chin). A chin implant offers a permanent solution for people who want more shape in their jawline to balance out a ‘weak’ or ‘small’ chin. Chin implants come in many shapes and sizes and are made from silicon rubber or medpor, a type of biocompatible plastic. These implants are used in a surgical procedure that reshapes the chin by placing an implant in the chin. Chin implant surgery (also known as chin augmentation, chin surgery or mentoplasty) is popular with both women and men. It can be helpful in balancing out a larger nose. Who is suitable for chin implant surgery? Chin implant surgery can help balance your facial features. Ideally, all of your facial features should be proportionate to each other. If your lower jaw is set back or undersized, it can portray a weaker jaw and project a less masculine appearance. This relatively easy cosmetic procedure is effective at creating a significant improvement in your profile. It is important to note that you need to have realistic expectations chin implant surgery. A good candidate for chin implant surgery is ideally a non-smoker and needs to be in good health. What happens during chin implant surgery? During chin implant surgery your Cosmetic Surgeon has two surgical techniques they can consider using. They can insert the chin implant externally under the chin along its natural crease line. Or they can insert the implant orally by making a small incision on the inside of your mouth at the intersection of the lower lip and gum. Chin implant surgery can be performed under local or general anaesthesia. Most patients return to work 7-10 days after the procedure. You can read more about chin implant surgery and the recovery process here. Once your chin implant has been inserted and positioned, it will be secured onto the soft tissues of your chin with sutures or screws. It is important to note that every surgical procedure as risks and complications. While the risks and complications of chin implant surgery are rare, they can involve infection or shifting of the implant, numbness and/or scarring of the chin. It is important to note that the final results of chin augmentation surgery are usually seen 3 to 4 months following the surgery. Some patients report the best results are seen up to 12 months after chin implant surgery. Are there any risks or complications associated with chin implant surgery? To reduce the risks and complications of chin implant surgery, it is important to choose a highly trained and experienced Cosmetic Surgeon. Are there alternatives to having chin implant surgery? Surgical and non-surgical alternatives to chin implant including genioplasty (chin augmentation) and dermal fillers. Genioplasty surgery increases the bone of your chin so it protrudes forward more. In some cases, bone grafts are used. If your also have an overbite, you may need to have your bite corrected. This will require expert assessment by your Cosmetic Surgeon consulting with an Orthodontist. Non-surgically, chin augmentation can be realised with injectable dermal fillers. I want chin implant surgery. Where do I find the best Australia Cosmetic Surgeons who specialise in chin implants? Even though chin implant surgery is a relatively minor cosmetic procedure, we suggest that you have realistic expectations and consult with several Cosmetic Surgeons. It is important to note that while chin implant surgery is usually effective and relatively safe, there are risks and complications to consider. You can find the best Australian Chin Implant Surgeons here. Had rhinoplasty but don’t like the results? 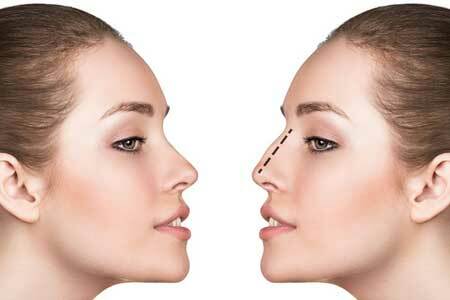 Revision rhinoplasty can help!